Liquid penetrant processes are non-destructive testing methods for detecting discontinuities that are open to surface. They may be effectively used in the inspection of both ferrous and non-ferrous metals and on non-porous, non-metallic materials, such as ceramics, plastics and glass. Surface discontinuities, such as cracks, seams, laps, cold shuts and laminations, are indicated by these methods. Flaw detection with the help of liquid penetrant is being increasingly used in various industries in the country and recommendations of a general character providing guidance on the applications of these methods are considered necessary. IS 3658:1999 Code of Practice for Liquid Penetration Flaw Detection (second revision). Reaffirmed- May 2014. A suitable liquid penetrant is applied to the surface of the component under examination and is permitted to remain there for sufficient time to allow the liquid to penetrant into any defects open at the surface. After the penetrant time, the excess penetrant, which remain on the surface, is removed. Then a light coloured, powder absorbent called a developer is applied to the surface. This developer acts as a blotter and draws out a portion of the penetrant which had previously seeped into the surface openings. As the penetrant is drawn out, it diffuses into the coating of the developer, forming indications of the surface discontinuities or flaws (Fig. 2 to 5). In general satisfactory results can be obtained when the surface is in the as welded. as rolled, as cast, or as forged condition but surface preparation by grinding or machining or other method may be necessary in some instances when surface irregularities could otherwise mask indications of unacceptable discontinuities. Heavy grinding should be avoided to avoid the masking of fine defects. However, any mechanical working leaning should be followed by suitable etching. The surface to be examined and all adjacent areas within at least 25 mm should be dry, free from any dirt, lint, grease, welding flux, weld spatter, oil, or other extraneous matter that could obscure surface openings or otherwise interfere with the examination. The method of cleaning depends on the nature of the material of the part and contaminants. Typical cleaning facilities make use of detergents, organic solvents, descaling solutions, alkali solutions, paints removers, vapour degreasing, ultrasonic cleaning, abrasive blasting, etc. Blasting with shots or dull sand is permissible only when it does not peen over or fill the voids, as this drastically reduces the accuracy of the inspection. It is essential that parts be thoroughly dried after cleaning so that FO water or solvent remains in or over the discontinuities, as this will hinder entrance of the penetrant. Drying may be accomplished by warming the parts with infrared lamps, drying ovens, forced air circulation, etc. After the part has been thoroughly cleaned, apply the penetrant to the surface to be inspected. In case of small components, they may be dipped in a tank of penetrant. 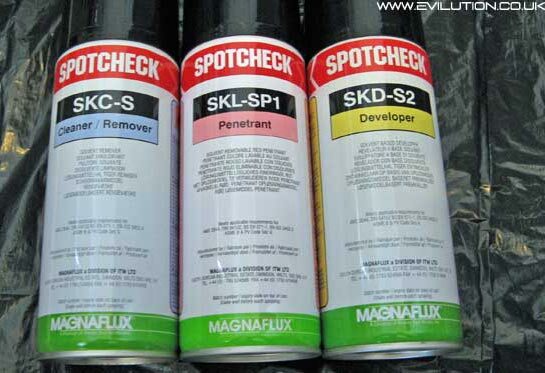 Where only a local area of a component is to be tested, the penetrant may be applied by a brush or spray. Regardless of how it is applied, it is important that all surfaces are wet by the penetrant. The length of penetration time is critical and depends upon the type of material being inspected, type of penetrant, kind and size of defect anticipated together with the temperature of the penetrant. In the standard testing temperature range of 15-60°C, and using post emulsified/solvent removable penetrants, a minimum of 10 minutes shall be allowed as standard penetration time; and for cracks with specially narrow widths, twice the time given above should be allowed. If water washable penetrants are used, the penetration time shall be about 1.5 to 2.0 times of that stated above. When a high viscosity fluorescent penetrant is used, the penetration time may be longer than the normal penetration time. In such a case, time shall he subject to agreement between the manufacturer and the purchaser. An extremely, long penetration time does not affect the results except to increase the brilliance of indications slightly and make removal of the excess penetrant more difficult. After allowing for necessary penetrant time, the surface film of penetrant on the part is removed by rinsing. The rinsing must be through and complete so that the penetrant within the discontinuities of the part alone is intact. Special attention should be given to drilled holes and threads, which are highly prone to retain penetrant. Using water washable penetrant, rinsing should be done with water spray nozzle. The temperature maintains pressure of rinsing water should not exceed 43°C and 3 kg/cm’, respectively, otherwise water may remove some of the penetrant from larger or shallower discontinuities. The distance between the nozzle and the part should be not less than 300 mm and the angle of spray should be 45° to the wash surface for ideal results. The water droplet from the nozzle should be spray type rather than pointed. Using post emulsifying penetrants, an additional step is required. This is the application of a liquid emulsifier prior to rinsing operation. The emulsifier may be applied by spraying or dipping. The emulsifying time is critical and depends on the type of emulsifier surface roughness and types of defects sought. It may vary from 10 seconds to 5 minutes. The usual time is 2 to 3 minutes. After emulsification, the mixture is removed by a water spray, using the same procedure as for water washable liquid penetrant. While using solvent removable penetrants, care should be taken not to use while excess of the solvent to avoid removal of penetrants from defects. On smooth surfaces, it may be possible sometimes to remove excess penetrant merely by wiping the surface with clean dry lint free rags. Using fluorescent type of penetrant, it is helpful to use portable black light source, while rinsing, so as to ensure that rinsing operation is complete. Rest of the procedure is same as outlined for dye penetrants. The piece after removal of excess penetrant should be dried with the help of dry lint free cloth, by normal evaporation method at ambient temperature and/or by application of low pressure compressed air at a temperature not exceeding by 50°C. After washing off the surface penetrant in the rinsing operation, apply developer to the part to blot back to the surface any penetrant that may have penetrated into discontinuities. Developers are either of dry type or wet type. Dry developer is a powder and can be applied by dipping the part in powder chamber, a hand powder bulb, a tower gun or in a dust storm chamber after drying the part by warm air or hot air circulation oven. Oven temperature should not exceed 1 10°C and the part surface temperature should not exceed 55°C. Wet developer is a suspension of powder in water or a volatile solvent. It is applied by dipping or spraying and should be agitated before use to ensure uniform dispersal of solid particles in the carrier fluid. When the developer dries, a film of powder is left on the surface. Where a water suspension developer is used, drying time may be decreased by the use of warm air, or by keeping in hot air oven as per procedure mentioned above. Thick coatings and pools of wet developer may result in marking of indications. and shall be avoided. Developer, whether dry or wet, shall be applied as soon as possible after removal of the excess penetrant. A developing time should be allowed before final inspection of the part to allow the developer to bring back to the surface the penetrant that may be in discontinuities. Excessively long developing time of around 10 min is generally adequate may cause the penetrant in large deep discontinuities to bleed profusely, making a broad, smudgy indication and making appraisal of true size and type of defect difficult. A good practice is to start observation as soon developer is applied. With visible dye penetrants, surface defects are indicated by bleeding out of penetrant, which is normally of deep red colour, against white background. Adequate illumination of 400 to, 800 LUX of white light (500 LUX can be obtained by 80 watts of day light fluorescent tube at 1 meter/100 watts tungsten filament lamp at 0.2 metres distance) should be provided. With fluorescent penetrants, inspection is carried out in a darkened area using high intensity black light, whereby indications fluorescence brilliantly. A portable hand lamp should be used over the surface of large parts. Small parts are conveniently viewed under a fixed light. Adequate black light for inspection is obtained by using a 100 watt mercury vapour bulb of the sealed reflector type and a special filter which filters out most of visible light. Black light intensity of 800-l 800 microwatt/cm* as measured by a black light meter placed in the position of job is adequate. The operator should allow his eye to become accustomed to the darkness of the inspection booth before inspecting the part. Black light (wave length 365 ± 15 mm) is injurious to the skin and eyes and hence viewing of black light shall be avoided. It would be further desirable for the operator to wear protective spectacles when using black light. Usually a crack or similar opening will show a line and tight crack or a partially welded lap will show a broken line. Gross porosity may produce large indications covering an entire area. Very fine porosity will be indicated by random dots. When an indicated pattern has appeared, the evaluation must be made to ascertain if the pattern is attributed to the actual flaw or an apparent one. Depth of surface discontinuities may be correlated with the richness of colour and speed of bleeding. Wiping the first layer, of developer and immediately spraying the second coat may help in judging the depth of flaw by observing speed and intensity of second bleeding. Retest must be done from cleaning stage in case if any error in procedure was noticed, or when a difficulty was found to ascertain whether the indicated pattern is due to actual flaw or an apparent one. A surface which has been treated with a colour contrast penetrant shall not subsequently be processed with any other fluorescent penetrant unless the job has been thoroughly cleaned, since residuals may react with fluorescent penetrant resulting in complete or partial quenching or fluorescence. The nature, size, type and location of defects shall be recorded. Thorough cleaning of test pieces shall be carried out after inspection to ensure that no corrosive action takes place, on the same due to penetrant chemicals. The liquid penetrant system should be periodically checked to ensure they are efficient, maintained within prescribed concentration ranges and are free of excessive muddiness or sedimentation. The manufacturers of liquid penetrant systems shall specifying the expiry dates in each case on the containers of the penetrant cleaner and developer. The efficiency of dye penetrant may be checked by the use of specimens known to contain defects or by means of parts with artificial defects. One way to prepare test blocks is to take a 75 mm x 50 mm x 12 mm bar of duralumin. The block is heated to above 525°C over a burner, the heat being applied to the centre of the block. When the requisite temperature is reached the block is immediately quenched in cold water. This causes cracks to be formed on the block. ‘Repeated heating on alternate faces and subsequent quenching is needed to cause cracks’ after the words ‘formed on the block’. The block is then moderately heated to drive off water and a cut is made on either face of the block at the centre with a band saw. While comparing two penetrants materials or techniques, the slot provides the means of avoiding intermixing of samples under test. The same block or test specimens should not be used repeatedly because the cracks gradually get filled up with the developer and it will be difficult to restore to original condition even with effective cleaning procedure. Apart from the comparator block mentioned above, set of nickel chrome test panel can also be used. This consists of a set of 3 nickel chrome panels, namely ‘Coarse’, ‘Medium’, and ‘Fine’ having surface cracks of varying dimensions. The coarse test panel is designed for testing of visible dye penetrants and low performance fluorescent penetrants, the medium test panel for high performance visible dye penetrants and for medium performance fluorescent penetrants while the fine panel is for high performance fluorescent penetrants.